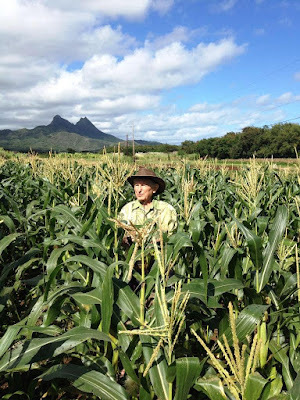 Industrial agriculture companies producing seeds in Hawaii mainly for corn research and reproduction had a second consecutive season of steady operations after three years of declines, according to a preliminary government estimate. Star-Advertiser. More than a year out from the 2018 election, Gov. David Ige presents a tempting but also formidable target for some ambitious Democrats, and several are weighing the possibility of a run against him. Star-Advertiser. At least a half-dozen politicians are already eyeing the race for Hawaii lieutenant governor next year, including Maui’s mayor and a number of state legislators. Star-Advertiser. Civil Beat Poll: Tulsi Gabbard’s Surprising Plunge In Hawaii. Statewide, Brian Schatz and Mazie Hirono are viewed more favorably than Gabbard while Colleen Hanabusa’s numbers are slightly lower. Civil Beat. Hawaii’s wealthy make up the majority of residents who have rooftop solar, and two programs the state created to change that are floundering. Star-Advertiser. More than a year after the state awarded its first eight medical marijuana dispensary licenses, three companies have each harvested their first crop, but not a single bud has been sold. Star-Advertiser. Hawaii’s Tech Sector Is Suffering From A Lack Of Top Business Execs. There is marketable technology in the islands, but commercial success requires talented entrepreneurs who are hard to find. Civil Beat. Hawaii has received $4.1 million for AmeriCorps projects from the federal agency that oversees volunteering and service programs. Star-Advertiser. Native Hawaiians face a greater risk of developing, and dying from cancer-associated sepsis. Experts at the University of Hawai'i Cancer Center made this discovery from analyzing decades of research. KITV. Honolulu-based Matson Inc. will increase the frequency of its South Pacific Express service to Samoa and American Samoa from 28 days to 14 days. Pacific Business News. Honolulu City Council members Wednesday will consider two different versions of a bill aimed at closing loopholes in Oahu’s existing plastic bag ban: one supported by business interests and the other by environmental groups. Star-Advertiser. The city plans to take a new approach this week to clear out a handful of persistent homeless encampments on state-owned, grassy medians along Nimitz Highway that thousands of tourists drive past on their way from Daniel K. Inouye International Airport to Waikiki. Star-Advertiser. Developer Wants To Convert Farmland To Housing In Haleiwa. He calls it “working class housing.” Opponents decry more traffic congestion and the loss of agricultural space. Civil Beat. The mayor’s representative erred when he told attendees at Tuesday’s Hawaii Kai Neighborhood Board meeting that the city dropped previous efforts to condemn a certain private lane for beach access in the late 1990s after the state Supreme Court overturned the condemnation. Star-Advertiser. The city intends to refund nearly $500,000 in property taxes that it inappropriately collected over two years from farmers for a controversial off-the-grid agriculture development in Kunia. Star-Advertiser. NOAA researchers are mourning the death of a Hawaiian monk seal that some have known for years. KHON2. Henry B. Clark, who retired as chairman, president and CEO of Castle & Cooke more than 30 years ago after a 40-year career, has died. He was 101. Pacific Business News. Second homes, commercial and industrial property and hotel/resorts would bear more of the property tax burden in order to give homeowners and farmers less of a rate hike, under proposals to be heard Monday as the County Council takes its final vote on the budget. West Hawaii Today. Evans: Raises the reason for tax increase. West Hawaii Today. Citing a “need for a deeper awareness and understanding” of historically and culturally significant sites in a Kahaluu parcel eyed for development of a 306-unit condominium, the county’s planning director is asking the officer overseeing the contested case to reopen the hearing to hear more evidence and testimony from himself and other potential witnesses. West Hawaii Today. The Kamehameha Schools are accusing two companies of illegally harvesting eucalyptus trees on its properties along the Hamakua Coast. Associated Press. On May 25, Kamehameha Schools filed a complaint in the 3rd Circuit Court requesting the court grant immediate and permanent injunctive relief against defendants Jonathan P. Spies and his companies Hamakua Renewable Enterprises, LLC, and Golden Lion Hawaii, LLC, for trespassing and the illegal harvesting of eucalyptus trees on the school’s property in the Kapulena area. West Hawaii Today. Money for a joint state-county planning effort to revitalize the Banyan Drive resort area appears to be drying up. Big Island Video News. Parker Land Trust, a sister entity of Parker Ranch, claims in a foreclosure lawsuit that German industrialist and biofuel pioneer Michael Saalfeld owes more than $50 million for 3,500-plus acres of land he bought from the Waimea ranch in 2010. Tribune-Herald. Reforms could be on the way for the Hawaii Island Humane Society, where high euthanasia rates have frustrated Big Island residents. Civil Beat. Debbie Cravatta, president and founder of the nonprofit Kohala Animal Relocation and Education Service, was working with the veterinarian of the Molokai Humane Society, and the only veterinarian on that island, to sterilize a total of 30 animals Wednesday in Ocean View when conversation turned to a separate ongoing effort to rescue dozens of dogs from another property in the area and how her group could help. West Hawaii Today. The University of Hawaii at Hilo is increasing marketing efforts to spread the word about its new dorm repricing plan, which will knock the annual cost of its most underused residence hall by about $1,400 next year. Tribune-Herald. On the heels of the state Legislature approving funding for continued development of an industrial hemp program, Hawaii Island hosts the first Hawaii Hemp Conference next weekend. Tribune-Herald. A Hilo food business has issued a recall of frozen ahi that tested positive for hepatitis A. Tribune-Herald. Two real estate firms are close to submitting an application to the county to build a 324-unit workforce rental apartment project along Waiale Road in Wailuku. Maui News. The world of Korean natural farming is like a glimpse into a mad scientist’s lab. Garden Island. The County Council’s Policy, Economic Development and Agriculture Committee will meet Monday at 9 a.m. in the Council Chambers to discuss the Federal Food Safety Modernization Act, or FSMA. Maui News. Maui’s first two utility-scale solar power projects in South and West Maui, which could supply up to 6 megawatts of power, are expected to come online by the second half of this year, a Maui Electric Co. spokeswoman said last week. Maui News. Kauai Council Chairman Mel Rapozo responds to news reports of the council eliminating the auditor's office: The council partially funded the office, using a term referred to in government accounting as “dollar funding.” With the exception of the building lease and electricity costs, which received three months of funding, and the copier machine under contract, $1 of funding was left as a placeholder for each salaried position and related benefits and other office expenses in place. Garden Island. Council Chair Mel Rapozo said he can’t approve a request to apply for state funds to relocate the Hanalei National Wildlife Refuge overlook because of a lack of community participation. Garden Island. The Kauai Humane Society needs your help. As of Friday, KHS had 71 dogs and puppies, 75 cats and kittens, six guinea pigs and a rabbit up for adoption. Garden Island.